Modern 4 Star hotel with air-conditioned rooms. 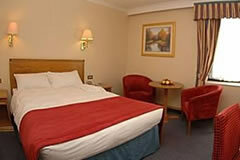 Modern 4 Star hotel, ideally Located just 500 Yards from the all terminals. 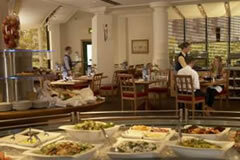 Offers excellent facilities, inc. Gym and 3 bars and restaurants. Air con, soundproof windows, telephone, hairdryer, tea/coffee making facilities ,TV with satelite channels & pay movies, trouser press, high speed internet access, data port. On-site overnight parking charged at £15 per day. Park and fly package includes on-site parking. Masons Restaurant offering a selection of classics, with an emphasis on fresh produce, with a wood-stone oven at its heart, open 04:30 to 22.00 and Masons Bar open 11:00 - 23:00 with a lounge menu for lighter meals where you cal enjoy a Costa Coffee as well as 24 hour room service. Hotel looked a bit tired. Large badly repaired crack in wash hand basin and dirty water outlet ,not too hygienic. Service from airport ,reception staff and bar staff very good. First room stunk of urine, second room didn't have towels. The signs to the hotel are poorly lit, you can't see the Hilton part. Staff very friendly and helpful, restaurant was fairly priced and good quality. Excellent service, straight forward - no problems will be definitely using you again!! If I pay for a room for four people should I expect sufficient toiletries etc.. for four people or am I being naive? We booked a family room for four people at the Manchester Airport Hilton well in advance however when we arrived at the room following a late night flight, there were only sufficient toiletries, tea, coffee, milk and cups for for two people. Since we had paid Â£160 for the room this was disappointing and...... no biscuits! I mentioned it to the person in Reception in the morning as we were leaving who gave me a blank look and also handed in a completed Feedback card left in the room with contact my details. I have not heard anything back so am left wondering if there was any point in completing the feedback. Do they do it just to make it seem as if they are listening to their customers?? Always excellent service in the hotel and with the transport to the airport and back. Great size family room for 3 adults and a child, quick check in, secure parking and prompt transport. Staff are always very helpful. Rooms are comfortable. Transport to terminal very efficient. Car parking well organised. Excelllent service and value for money. Most impressed and would use again. absolutely excellent - highly recommend this superb hotel, easy to drive to, perfect to park at and exemplary pick up service. The Hilton Manchester Airport is located next to Terminal 1. A 24-hour hotel courtesy bus runs on demand between the Hilton Manchester Airport hotel, Manchester International Airport and Manchester Airport station. Let the hotel know you want to be picked up using the dedicated courtesy phones located within all airport terminals and the airport train station. There will be a shuttle service provided by the Hotel that you can acquire by using the courtesy phones in all the terminals. Does the Hilton airport hotel move the car to the secure compound on arrival or at check out before the flight?if you park for 8 days the car will remain on site at the hotel. If you park for 15 days they will move the car to a secure compound on the morning of your flight.